Click the cover to download .pdf version. For assistance with spreads, bleeds, inserts and advertorials, please contact advertising staff. Ads are preferred on CD or by email and in the following formats: High Resolution PDF (Prefer PDF/X-1a-compliant) or a TIFF, JPEG, EPS. Up to 15 mg accepted via email. For larger files, call 800-598-8083 for FTP site coordinates, or other specific information. All files must be labeled clearly as to company and content, i.e. 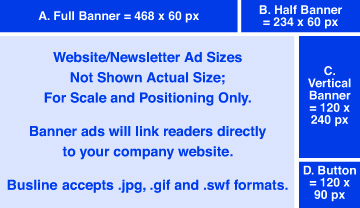 : companyname.ad.logo (this is extremely important when sending more than one item on file). Ads submitted as electronic files require a hard copy proof along with the CD. Busline Magazine will not be responsible for mistakes in a printed ad if a hard copy is not submitted with the electronic file. Four-color ads must be submitted with a color proof (Iris print, 3M Rainbow print, Laser print) that reflects mechanical aspects of the ad.